chelsea boots are suddenly en vogue. well, maybe suddenly is the wrong word choice. they never really go out of style. they’re classics. i’ve had my eye on these common projects chelsea boots since 2012. i regret not following through with the purchase because kanye started wearing them and if ye’s wearing them then that means they’re going to be harder and harder to get (duh). i’ve been hesitant to mention them on here because i wasn’t sure how i felt about the color choices – tan and grey. i’m on board now. you can pre-order a pair on barneys website, but they won’t ship until february. we’ll call that they ye effect. new york fashion week is going on right now. usually, i don’t pay too much attention to #nyfw, but i follow so many bloggers and style writers on twitter that i can no longer ignore it. 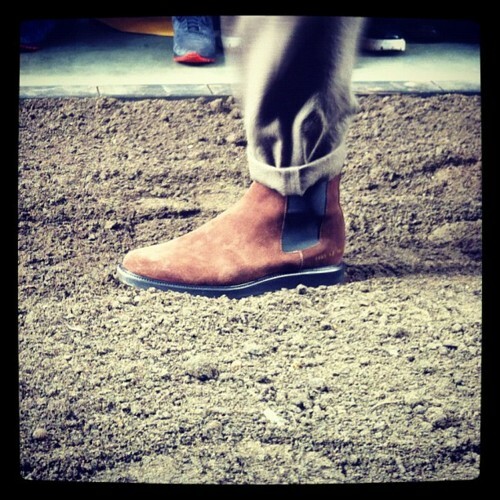 one thing that caught my eye yesterday were these common projects for robert geller f/w 2012 chelsea boots. the good people at park & bond were nice enough to share this picture on their tumblr. i’m not a big cp fan, but i could become one after seeing these bad boys.